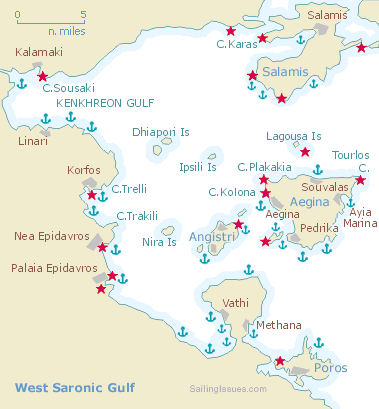 The Saronic gulf - Σαρωνικός κόλπος is due to its proximity to Athens - Αθήνα the prime yacht charter area in Greece. 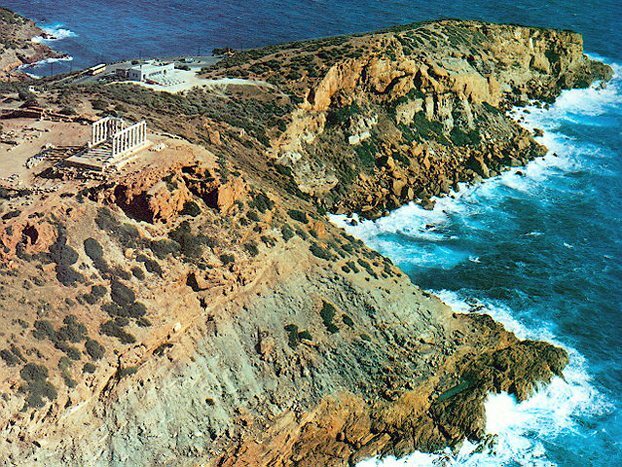 Apart from the location also the rich ancient history of places like Epidavros, Sounion, Poros, Aegina and Methana attracts tourists and sailors alike to these waters. Most charter yachts are based at the marinas along the Attic coast where the majority of the yacht charter companies operate. 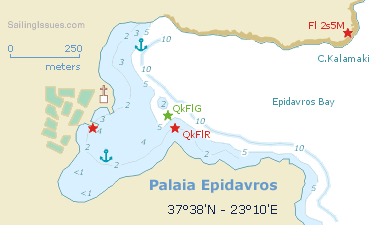 As a result of this concentration, many yachts follow the same trail and flock together at Aegina, Poros, Hydra and so forth. To avoid this pass these places at the start of your holiday and sail on (in front of the herd) for the east coast of the Peloponnese, where there are unspoilt harbours and anchorages. The western coast of the Saronic is mainly mountainous with a ridge running parallel to the shore (600 - 900 m) and rising to 112 m near the Methana peninsula. Higher up the land remains barren, but below densely wooded areas can be found. The normal summer winds depend heavily on where you are. During the summer the meltemi is the normal wind in this area. Along the mainland coast from the Corinth Canal to cape Sounion as well as the area between Methana and the mainland (Attica) it will blow Force 4-6, from NNE - NE. The winds are less strong near the Methana peninsula and Poros, whereas near cape Sounion they might be stronger. Furthermore, the meltemi blows with less regularity than in the Cycladic waters. 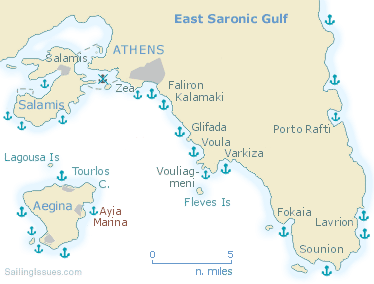 The Attic coast is mostly mountainous barren terrain, which holds 66% of the industrial activities of Greece especially around the island of Salamis and the harbour area of Piraeus. Between Piraeus and Glifada the coast is lined by high-rise apartment blocks; more than one third of the whole population lives in Athens. 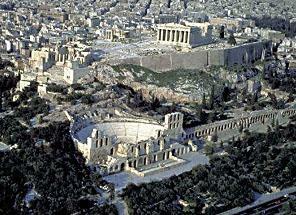 This modern architecture of Athens clashes with the ancient buildings and treasures. 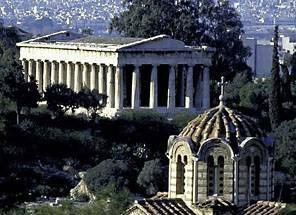 Until the first half of the 20th c. archaeologists were keen to demolish whole blocks of 'new' houses to excavate the lower lying libraries, shops, streets, temples, etc of ancient Athens. However, in the 1960's the local residents protested successfully against this wrecking of houses and streets, where they - and their parents before them - grew up. As yet, recent history prevails over ancient history. 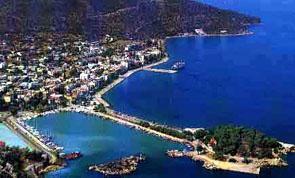 The Methana peninsula is an ancient volcano about 6 nm north-west of Poros island. Geologically, the island is very interesting indeed, but the peninsula also manifests itself in the form of very pungent solfataras. Go stern-to or bows-to opposite the local fishermen. The sulphurous waters will perhaps corrode your anchor chain, but makes perfect anti-fouling. The main attraction of Palaia Epidavros is its major archaeological site, approximately 35 km to the east (20 min. by taxi) with its evocative theatre (4th c. BCE) set in the forest. Build by Polykleitos as part of a much larger sanctuary, the 14000-seat theatre has extraordinary acoustics; whispered voices from the beaten earth stage are easily heard high up among the 54 tiers of seats. Palaia Epidavros itself is a beautiful little village set within lush surroundings. 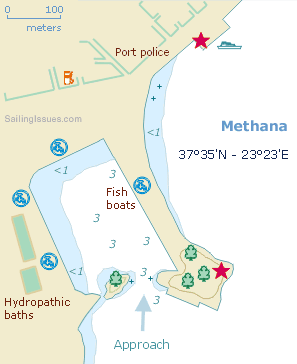 Anchor some distance away from the village (port police will instruct you to keep your distance to the beaches as well) or go stern-to or bows-to the quay. 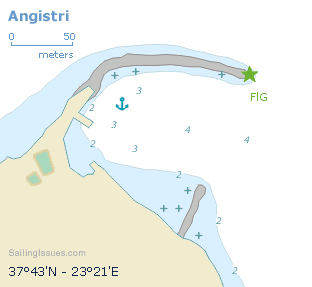 About 3 nm south-west of Aegina is the wooded island of Angistri (12 sq. km; 0-216 m), with a population of 700, descendents of Albanians who settled here in the 16th c.